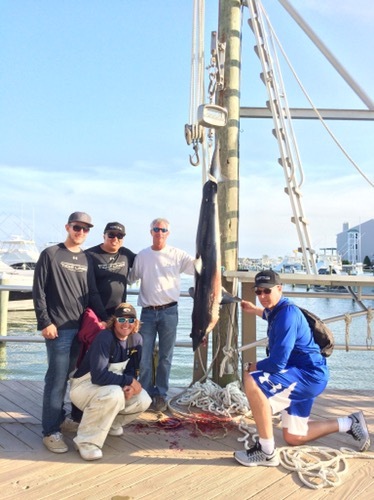 We decided to fish in the Avalon Meat Tournament this year aboard the 27′ Contender ‘Trade In’. Weather windows for center consoled have been tough to come by this June, but we got one and went for it. The ride out was way choppier then expected so we had to go slow which got us to the Canyon later then we would have liked. We got to the edge of the break in 66 degree water and climbing. I fired out a rod real quick and started moving the beanbags forward so we could get the spread out and WHAM! Fish On. Cullen put the bigeye boat side in less then 10 minutes and we started off the day right. We worked the break some more and it went up to 73 degrees on the warm side. Some guys were whacking yellowfins in the 30-40 pound range but we couldn’t get a bite from anything other then throwbacks and we didn’t even get many of them. The bite slowed up a lot by 7am and we got ourselves on the drift for a Mako Shark on the bottom of the West Wall of the Wilmington in the temperature break. We needed a three fish stringer so we decided to first legal mako we caught we would take to go try and get another crack at the tunas. Around 10:30 we had a Mako sky out in the back of the slick and a few minutes later he piled on the long bait (a whole mackerel with a rattle and an orange skirt). This little mako fought hard and peeled some drag, and after about 10 minutes we got the fish boatside and landed it. We got back on the troll but could not buy a bite. Some boats were picking at yellowfins and an occasional bigeye but overall fishing was slower. Still a great day on the water, and flat calm seas for most of our day. With nearly perfect weather and the day of the FULL MOON we made out way offshore looking for some action with sharks. Our first drift in 65 degree green water was nearly nonexistent but it did produce a 12 pound bluefish. We reset over some structure and wailed on sea bass pretty much for the remainder of the day catching over 100 but most were throwbacks. We did manage to release a blue shark. The kids had a blast and we couldn’t have asked for a prettier day. We were able to slip out on the Trade In searching for a women’s IGFA line class shark record. We had a solid 15 knot breeze out of the East right in our face for the ride out but luckily we only had to go about 35 miles. We setup in clean green 64.5 degree water and got on our drift around the Cayru Wreck. We put some time in on this drift, about 3 hours, covering good bottom structure but no bites. We reset and moved about 4 miles South to cover some good bottom structure there. At this point it was raining and blowing 20 knots out to theEast with made for very choppy seas but a perfect drift for shark fishing. About 45 minutes into the drift we had a good size blue shark come into the slick but never completed showed itself. 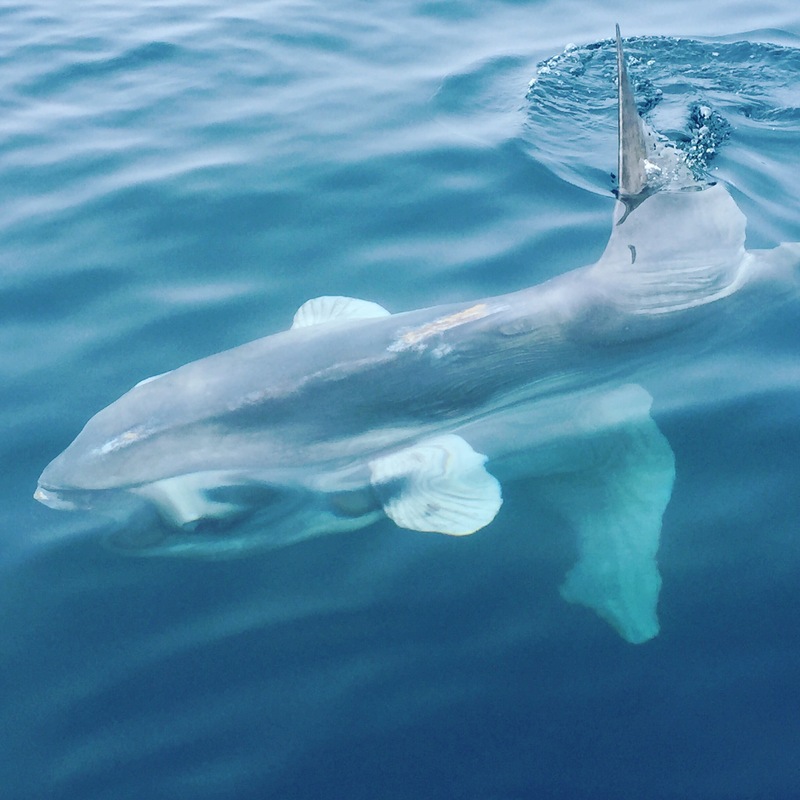 Immediately after a small blue shark arrived and he had a long leader hanging out of his mouth, so we got ahold of the leader and cut it close to the hook. Immediately after this another small blue shark comes into the slick and as we were messing with this little guy the big Blue showed up again. 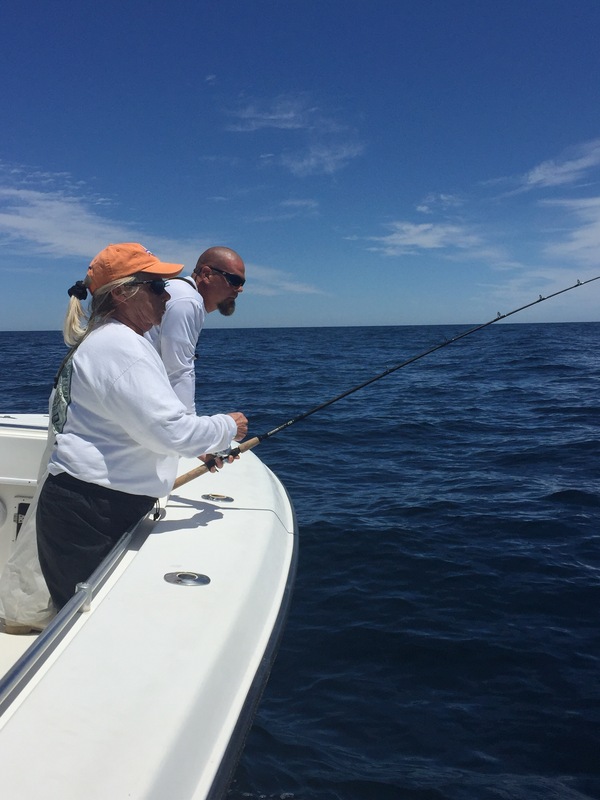 This blue shark was the right size for Maureen to get the record on 4# test so we pitched the 4# rod to the shark. It tool about 10 minutes for this shark to get interested in our baits and finally ate. After a very short fight Cullen was able to grab the leader and I got the flying gaff into the shark. 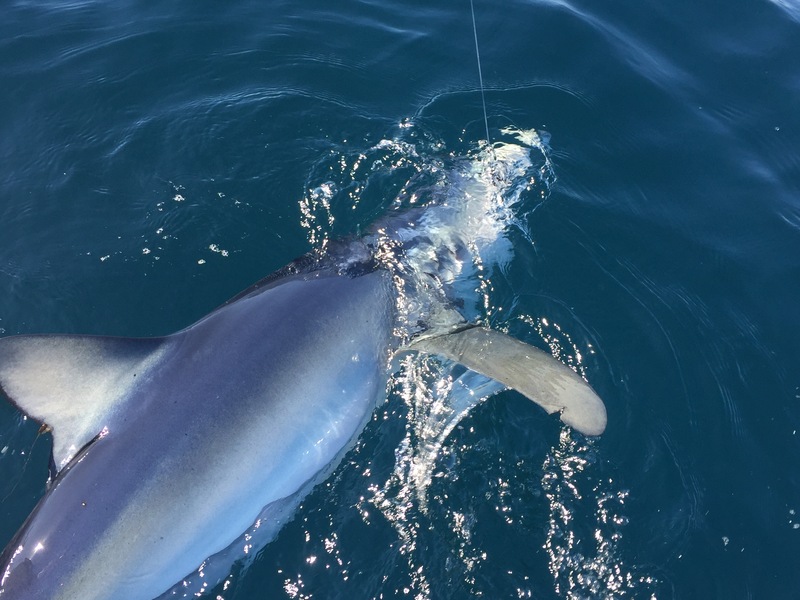 As blue sharks always do, this fish rolled and spun hard right up the wire leader and the rope on the flying gaff. He managed to pop the wire and rip the gaff out and took off. It all happened to fast and was a major bummer. Haven’t had that happen in quite some time and we have been working hard to get that fish. I guess we just have to stay on it. We went on to release a few more small blue sharks before we called it a day. Today we ran out on the 27′ Contender “Trade In” searching for some sharks for a line class record. We decided to give it a shot fishing the 20 fathom line. We had a Northerly wind at 12-18 knots and seas at 3-4 feet for the ride out and when we setup. Water was 64 degrees and a very clean green – the best water I have fished in yet this season. We setup on our first drift and a little over an hour in we got into a blue shark that definitely seemed to be big enough to break the women’s 4# test IGFA Record. Maureen Klause got hooked up and the fight was on. We chased the fish around a bit and had a few times where the swivel was within 8-10 feet away from Cullen’s reach, but that’s as close as the fish would give us. After an hour and 9 minutes the line parted and game over. Bummer, but I guess it wasn’t meant to be and is certainly all a part of the line class record fishing game. We reset on our drift with no success so we just made about a two mile move to another drop off and reset our drift. The wind spun around 180 degrees to start blowing out of the SW. A little over an hour into our drift we had a 6.5 foot blue shark sneak into our pitch bait. Cullen snatched it out of the way hickory since the fish wasn’t big enough for a record and we pitched it the spinning rod with a circle hook and a mackerel fillet to have a little fun before releasing the shark. We managed to do the same with two more blue sharks of similar size shortly after that one as well. We ended up having two more in the slick that were small in the 100-125 pound range. With the wind picking up we called it a day and headed in. 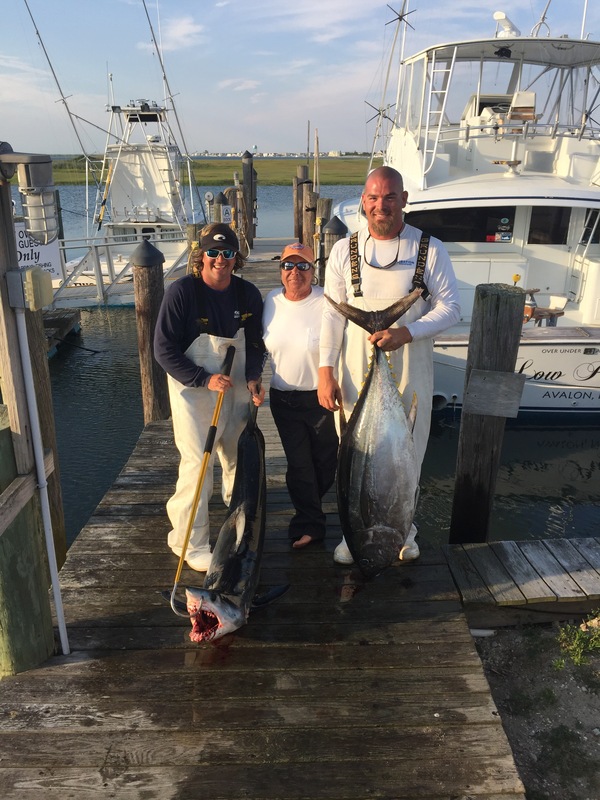 We fished the south jersey shark tournament on Friday and Saturday and had less then average fishing unfortunately. Day one we fished in 63 degree green water outside of the Hot Dog. We tried 4 drifts over different pieces of structure. We ended up releasing our first mako about 45 minutes into our first drift and it was about 125lbs. Shortly after we had another small mako on but pulled the hook. The rest of the day was very slow with no bites but did have a white Marlin in our slick which was very odd. Day 2 we tried the elephant trunk and India Arrow areas in 62 degree green water and put some time in doing longer drifts but no success other then a small blue shark. Not what we were hoping for. Sounded like overall slow fishing for most but Congrats to El Cid on a monster mako at 360 lbs to take the win! Today we fished in the Wounded Warrior shark tournament and headed out searching for some action with sharks. We started our day fishing in Masseys Canyon with a SE drift at 1 knot. Weather was overcast but very calm with a bit of a swell out of the East. Water was green and 65 degrees. We had a lot of bait marks that were sand eels on the bottom, but no bites here. We made a move out to the Hot Dog Notch with sinilar conditions and similar poor results. Then we made the move off more to the Hot Dog Bun and had much cleaner green water at 64 degrees. After about an hour into the drift we had a blue shark in the slick that never took a bait which was really odd. With time just about Out we got lucky and got a mako on. After a short fight we saw it was a legal fish and stuck the gaff in the fish. Mako for dinner tonight. Overall slow fishing but great day on the water seeing plenty of sea life and getting the bite we needed.